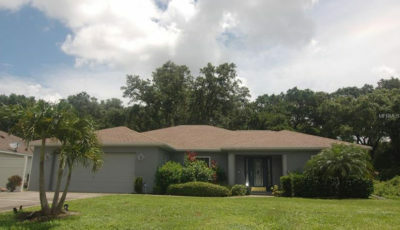 Here is your opportunity to own a 1400+ square foot, 3 bedroom, 2 bathroom, 2 car garage, lakefront home in Stone Creek. This home has been completely renovated inside and out and is situated on an over-sized lot with a fenced back yard. Sporting a smart great room design, this residence’s open floor plan has volume ceilings, split bedrooms for added privacy and high-end vinyl plank flooring in all but the carpeted bedrooms . The beautiful kitchen is open to the living spaces and offers plenty of solid wood cabinetry with soft-close hardware, solid surface counter tops and a full set of smudge proof stainless appliances. The carpeted master bedroom offers a totally updated bath, including vanity, walk-in shower and closet. On the opposite side of the home are the two carpeted guest bedrooms and another completely updated bath with a combination tub/shower. 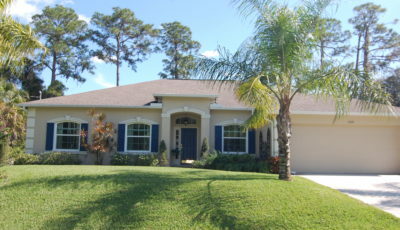 The roofed/screened lanai can be found off the great room and overlooks the fenced back yard and the tranquil lake. Even the garage has been freshly painted and has two storage closets and washer and dryer. This home looks and feels like new! See for yourself by viewing the attached 3D Virtual walk-through tour and/or by making your showing appointment today! This property will not last for long!